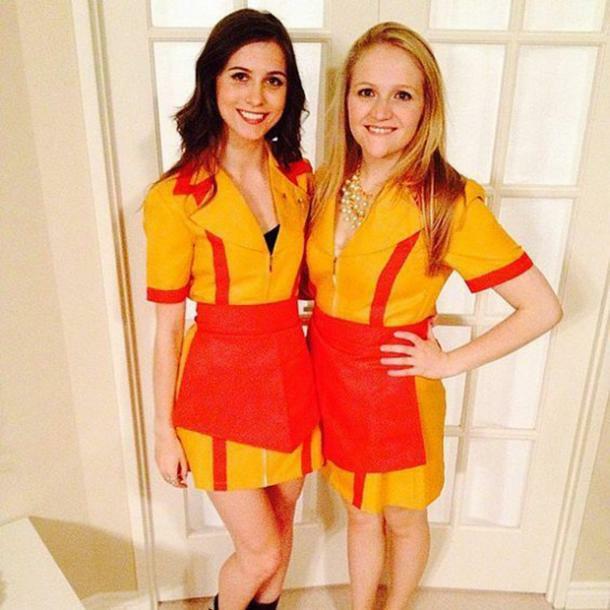 Do you and your best friend have plans to go out this Halloween, but you're still not sure what to dress up as? 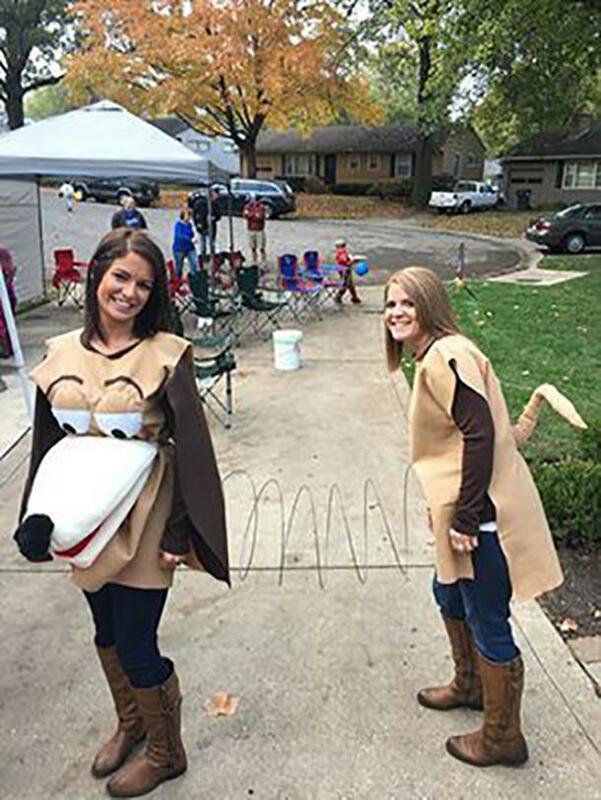 No need to worry, we’ve got the top 30 best friend costumes to choose from (or at least get your creative juices flowing) that will be perfect for trick-or-treating — or this year's hottest Halloween party. In my humble opinion, there is no greater season than Fall. I lose my mind over the changing colors of the trees, the cool air, and pumpkin everything. And fall would not be complete without the fun of Halloween! Between the fun of dressing up, the plethora of free candy (I’m an adult, but I still feel like the bonus Twix bars are the ultimate October-score), and the spooky feel of the occasion — it’s one of the best holidays of the year! When you begin making plans for Halloween, you tend to get caught up in the plans themselves and sort of forget to plan out a costume — especially if you're the one hosting this year. Whether it’s to go to a fun Halloween party, going out for a scary movie marathon, going to all the haunted houses, or simply taking the kids trick or treating (or even just staying home to hand out candy); you should always get in the spirit of things and dress up! Planning the perfect costume takes time. Especially if you and your bestie have decided to turn it into a fun DIY project that you’ll do together! (Lots of fun DIY ideas below!). But they don’t HAVE to. Sometimes only a little effort makes the best (and cutest) costumes. A lot of the costumes that made our list are quite easy to just throw together real quick (you may even have everything you need in the house!). 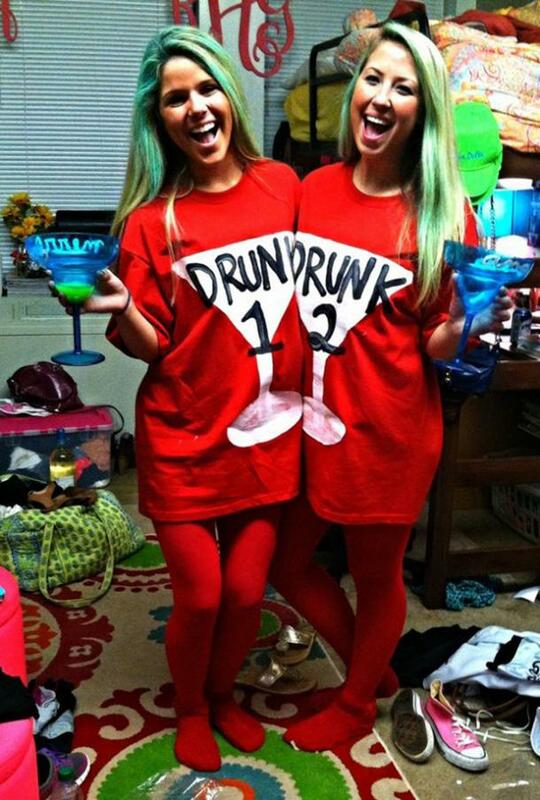 So, without further ado, let’s do the monster mash into these top 30 best friend Halloween costume ideas! Dress up like your favorite fairy “odd couple” from childhood – Cosmo and Wanda from Fairly Odd Parents. 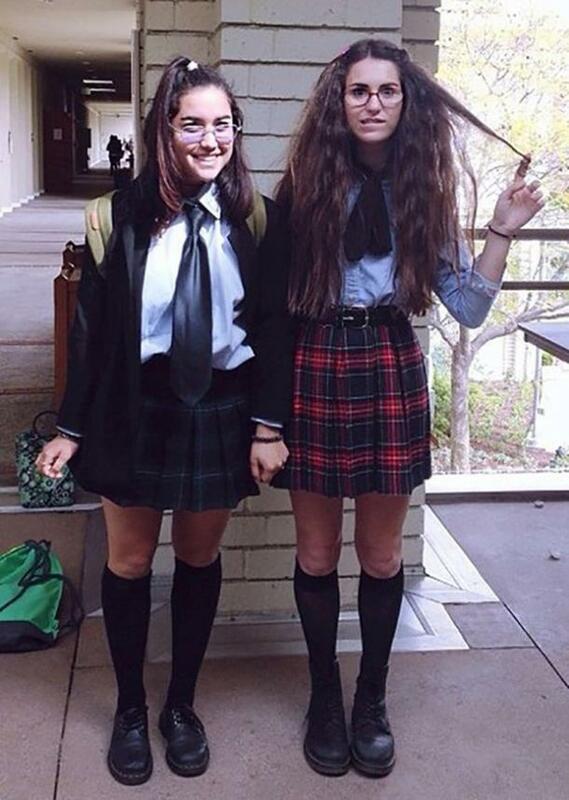 With this chic (borderline ) spin on these two wacky characters, you’re sure to have a fun Halloween. This cute and hilarious spin on the phrase “Netflix and Chill” is sure to get you lots of laughs (and keep you comfy as heck) all while staying relevant to the times! Wear some jeans, matching boots, and matching brown shirts and this cute and creative costume. But be careful not to get too far away from your bestie or you’ll break the spring. 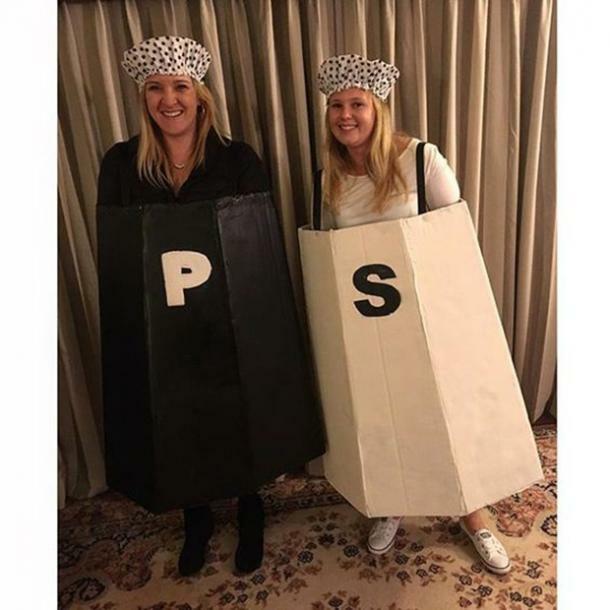 Get some matching black polka dot showers caps and use cardboard, duct tape and straps to make you and your best friend into giant salt and pepper shakers. 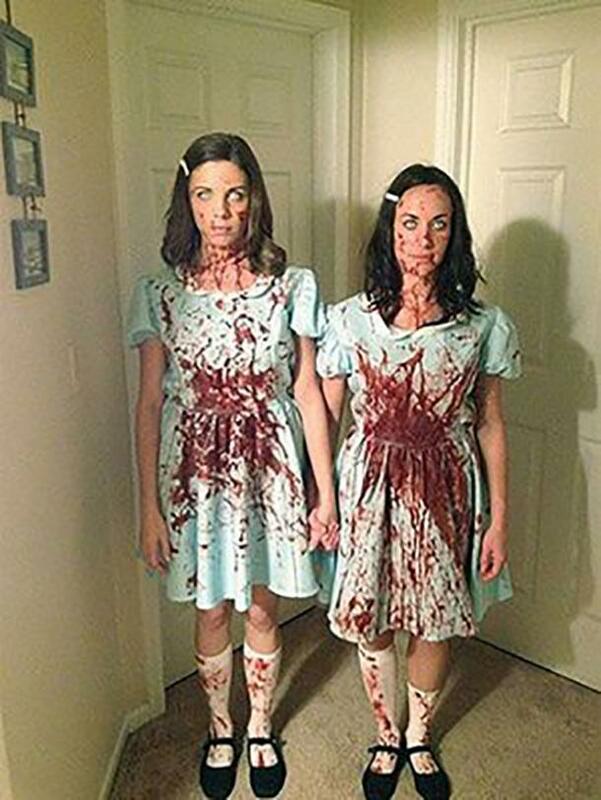 For the besties that think Halloween should be a scary holiday (I totally agree), dress up like the Grady twins from The Shining. It will really freak people out (it will be awesome!). Get some adorable mouse and cat ear head bands and be the classic chaos pals Tom and Jerry. Maybe even look up a makeup tutorial to get the right cat and mouse makeup looks going. Unicorns are SO in right now! Plus, this is a super easy one. Just get some matching unicorn head bands and dress in all white. It’s that simple! For extra flair you could add some sparkles around your eyes and some silvery makeup. A perfect one for the classic blonde and brunette duo. Dress up like Max and Caroline from Two Broke ! Personally, I’d make sure to get name tags and their signature jewelry (especially Caroline’s pearls and Max’s giant safety pins and cheap a-- earrings). Be the before and after versions of Princess Mia from The Princess Diaries. This could be especially effective for a straight haired and a curly haired best friend duo. Curly hair frizzes amazingly well to be the “before” Mia. Personally, I think the after Mia needs to take off the glasses (she gets contacts in the movie - duh!). 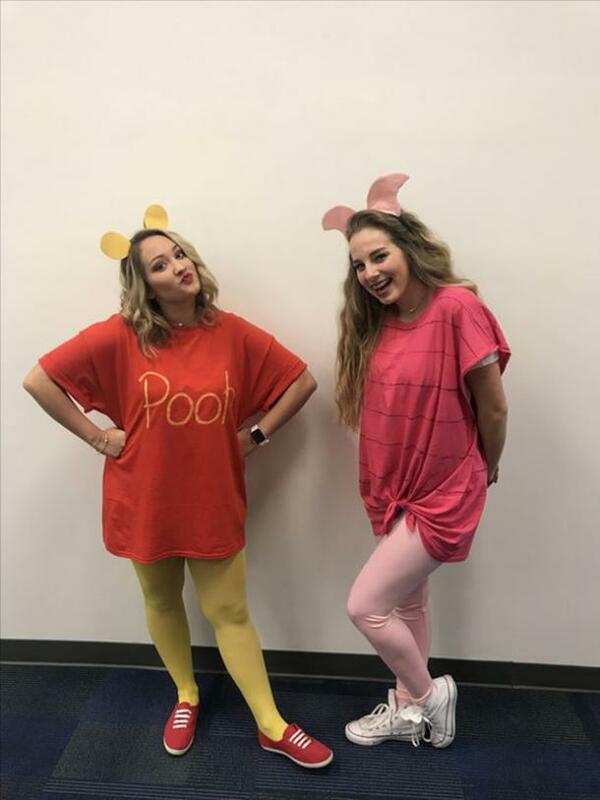 Be the classic best friends Pooh and Piglet. 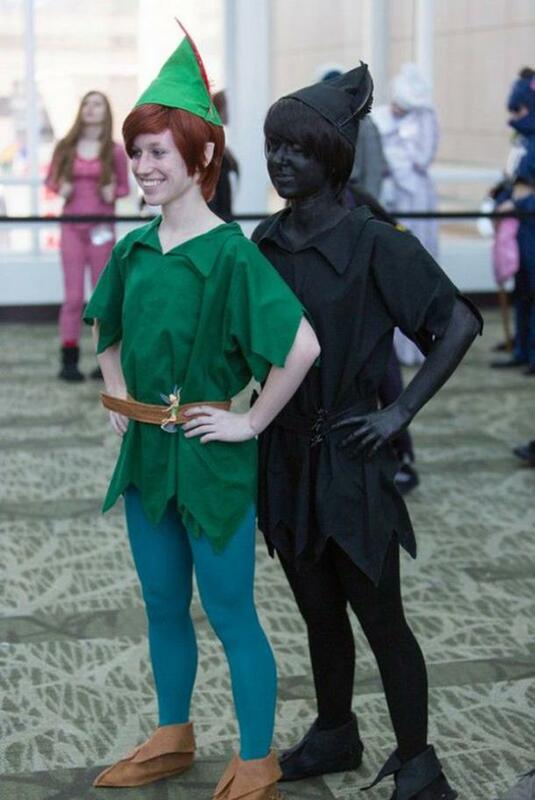 Plus, I’m sure there’s a video somewhere for how to DIY these costumes for cheap! For the darker best friends, take some of the innocence away from the girl scouts by dressing up like a pair of them going on a murder spree! 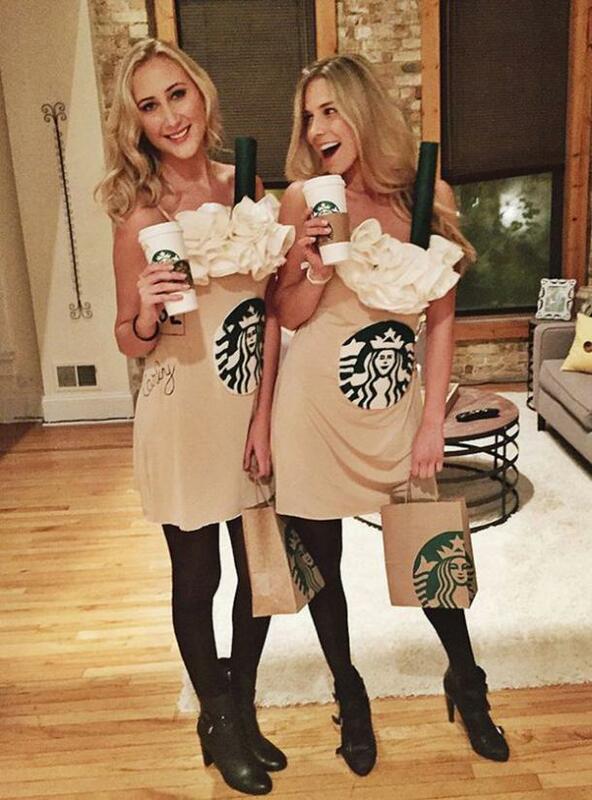 Embrace your inner basic white girl and dress up like giant Starbucks Frappuccino’s (yum!). Another super easy one to DIY, dress up like Lilo and Stitch. I mean we all have a weird friend that does a great “Stitch voice” … right? 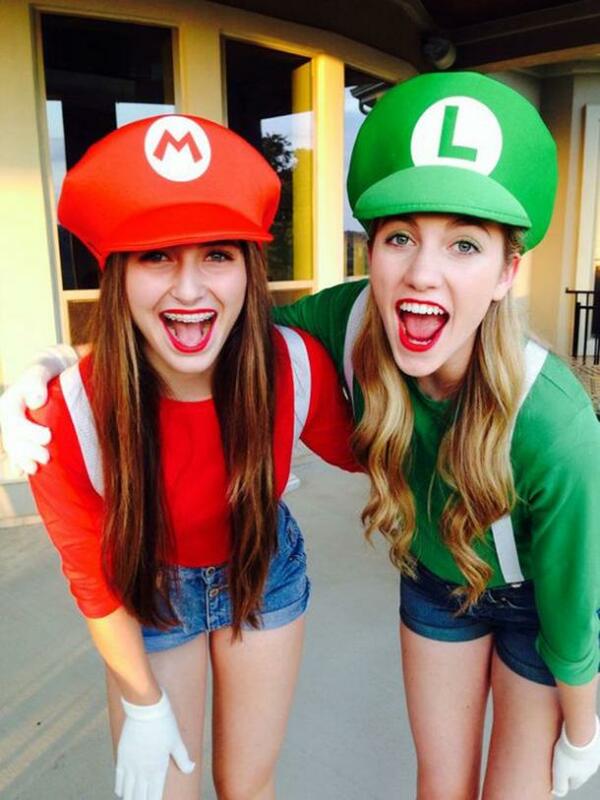 A staple for any two people going out on Hallows eve - Mario and Luigi! Personally, I’m a fan of also including fake mustaches, but that’s me. This one’s a bit more elaborate, but amazing so it seems worth it. 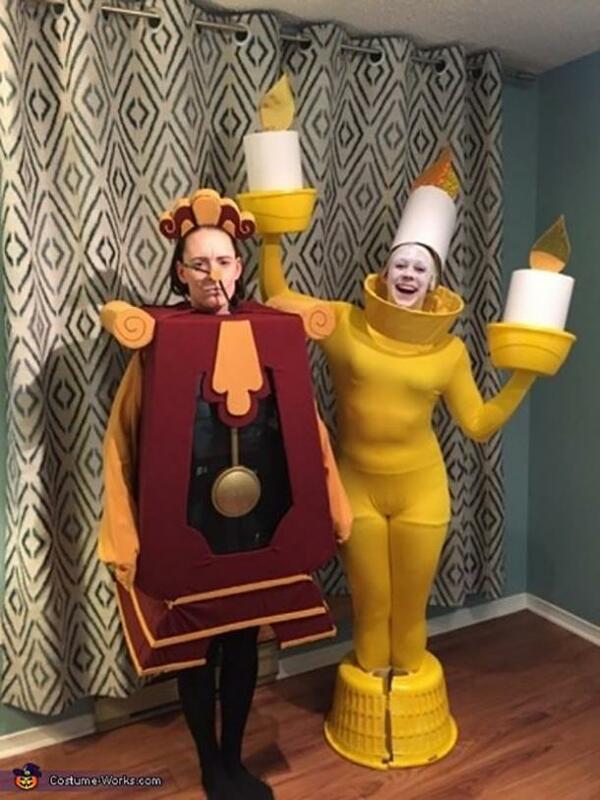 Lumiere and Cogsworth from Beauty and the Beast are just the bickering pair to make this Halloween fun. Is there a better fruit pairing than strawberry and banana? Well, besides pineapple and coconut (piña coladas anyone?). 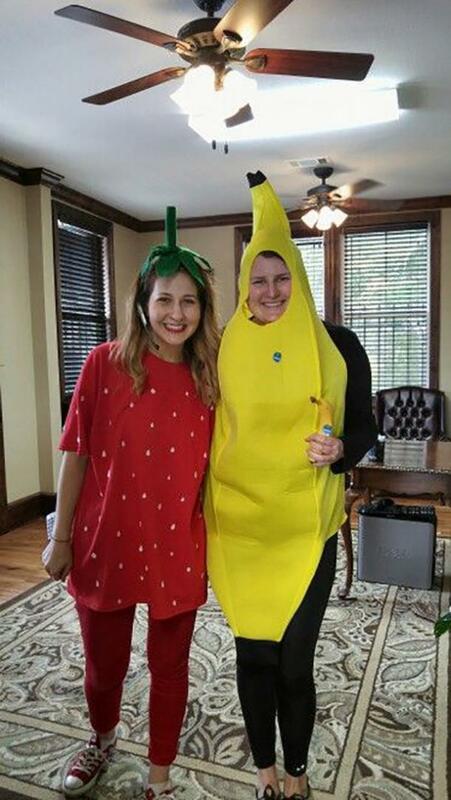 This strawberry costume would be easy to DIY and it’s pretty easy to get a simple banana costume at almost any Halloween store. A quick and easy one to DIY and look totally adorable when you’re done! Represent opposing sides of the world by being this super simple duo. Good and evil. Sugar and spice. Light and dark. We all need both in our lives. 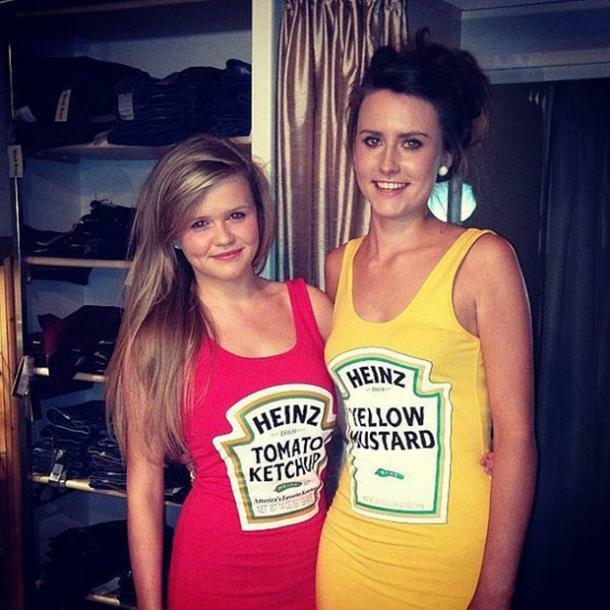 For those that aren’t super into dressing up just get some Ketchup and Mustard iron-ons and put them on red and yellow shirts and call it good. Where are my fellow horror movie buffs?! You have to love this feminine spin on the movie Freddy Vs. Jason! Personally, I think “Freddy Krueger” should mess up her face a little though. Who lives in a pineapple under the sea? 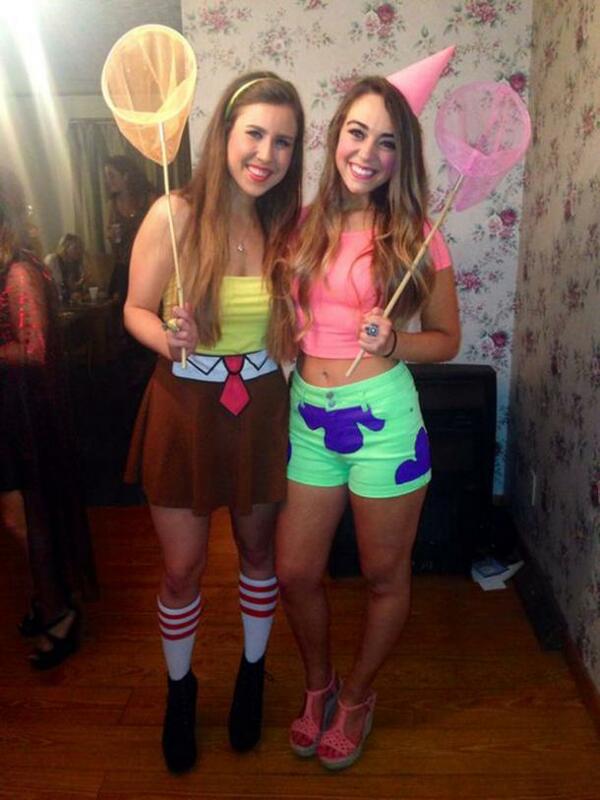 These super easy to DIY SpongeBob and Patrick costumes. Instead of going as the stereotypical Mario Brothers, go as the girl power duo from the Super Mario World - Princess Peach and Princess Daisy! Personally, I’m always Daisy when I play Mario Party, probably because I’m the brunette friend. 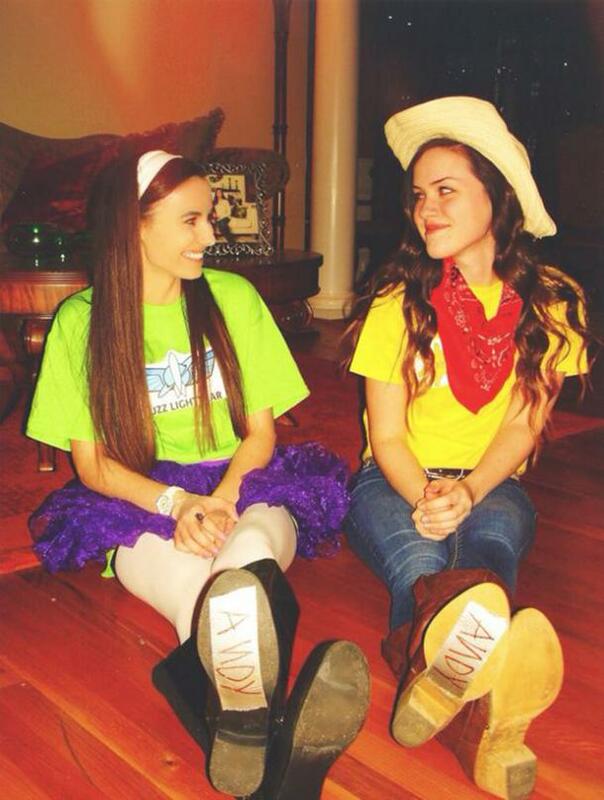 Another fun (and pretty easy) one to DIY, be girly Buzz and Woody from Toy Story! If you don’t put “Andy” on the bottom of your shoes, it totally doesn’t count though *wink, wink*. 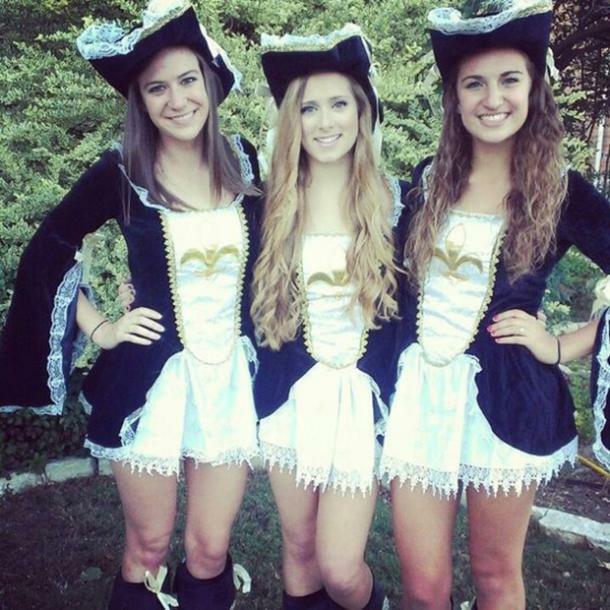 Perfect for Halloween parties! 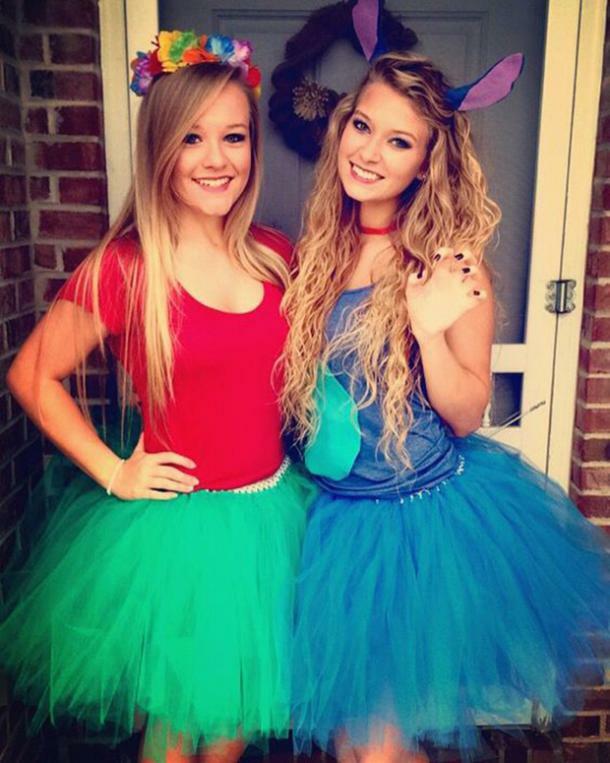 Take an adult spin on Dr. Seuss’ “Thing 1” and “Thing 2”, with these funny costumes (that are so easy to DIY, you could probably even do it tipsy). 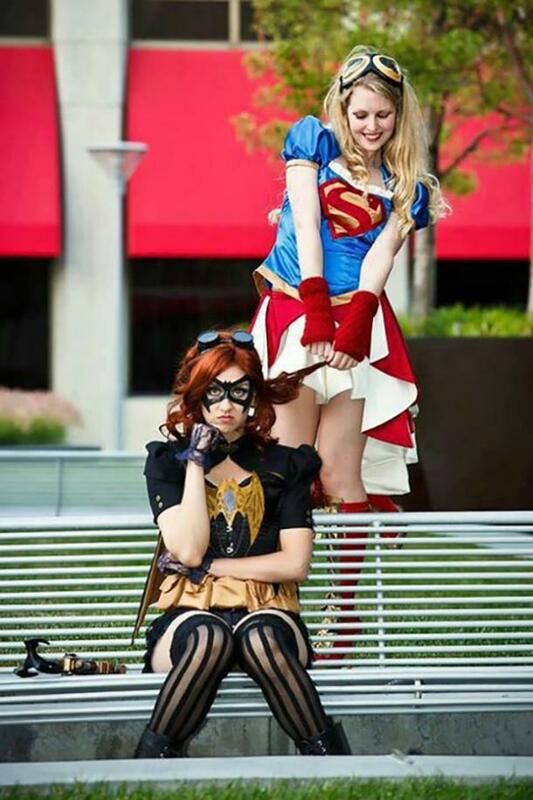 Go all out like in this cosplay picture, or simply wear super man and bat man shirts trick or treating. Easy peasy! Who’s the peanut butter to your jelly? Your bestie! Dress up like a Jiff jar and a Smuckers jar and tell the world! This is such a cool idea! Bonus: who ever gets to be the shadow gets to scare the heck out of people all night! It’s what Halloween’s all about! Another really easy one to DIY (with the exception of the gloves and leg warmers), be Sully and Boo from Monsters Inc. This one is great for groups of three (obviously), but if one of you doesn’t show up, you can always say you’re pirates (argh!). 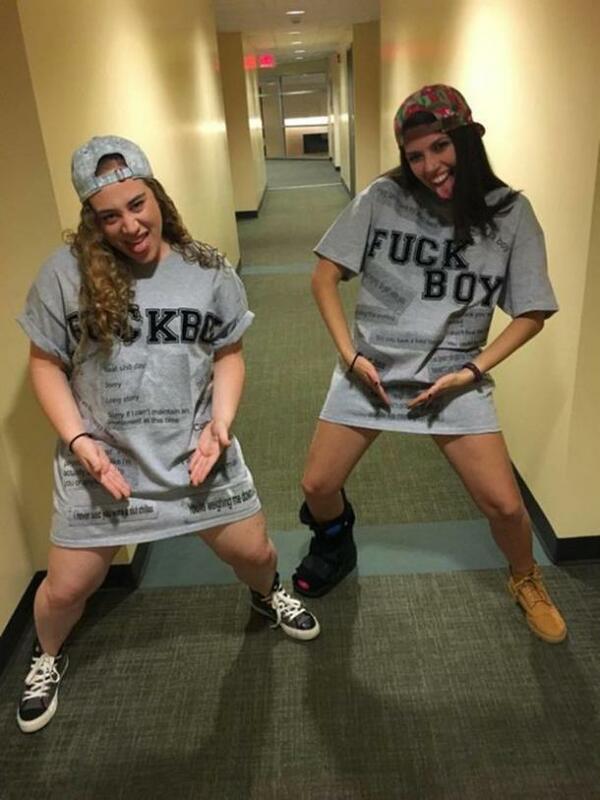 Barrow some clothes from your lame brother (be sure to wash them first) and dress up like f--- boys! These hilarious costumes are SUPER easy to put together last minute and are sure to get a bunch of laughs! Nicole Bradley-Bernard is a writer who covers pop culture, trends and fun quote articles. When she's not writing for YourTango, she enjoys putting bright colors in her hair, spending time outside on cool days and being with her partner in life, Eric.